At age 40+ the eye begins its journey into presbyopia, although this happens at differing rates we will all eventually develop a requirement for corrective lenses to assist us to read. However in today’s hi-tech world simple reading powers are no longer effective when using tablets, smart-phones or PC’s. 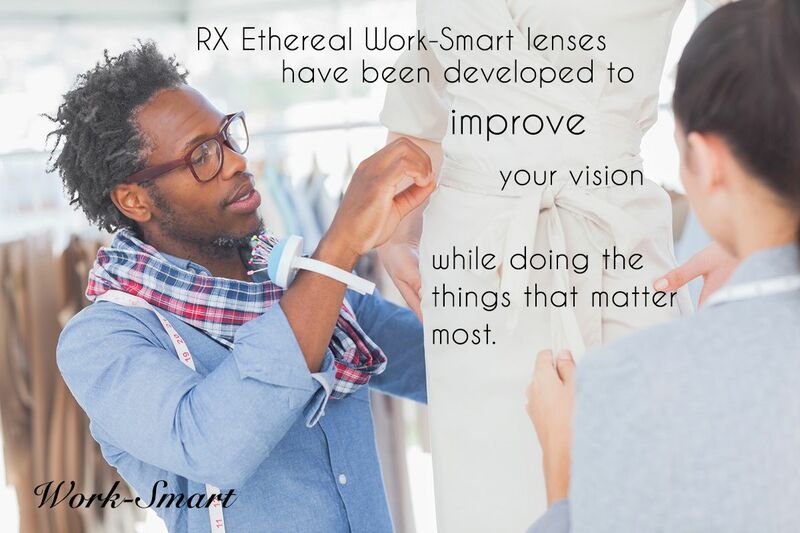 RX Ethereal occupational lenses are the perfect choice for your work, rest and hobby interests. Work-Smart lenses are made to suit specific occupational or social applications. Taking into account work or hobby interests this intelligent indoor lens will be tailored to suit every personal requirement. Whether for a dressmaker, draughtsman or chairman of the board there is a setting to suit. Work-Smart lenses are designed for use within a range of 0.5m to 4.0m, inform the optician where the lenses will be worn and what tasks will be performed and from there your Work-Smart lenses will be crafted to provide a perfect field of vision. The optical benefits of freeform lenses start with the highly sophisticated design software. Patient prescription, frame shape and wearing parameters are combined to create a calculation that optimizes your optical experience. 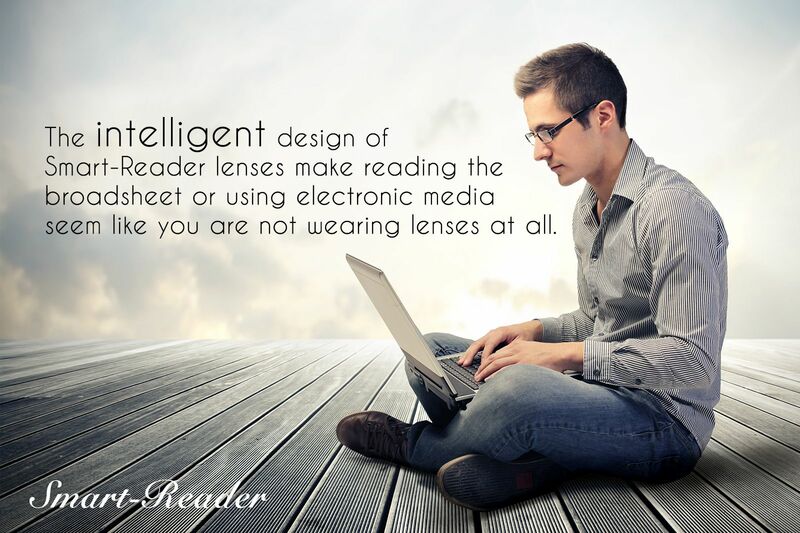 Smart-Reader lenses are designed with today’s hi-tech world in mind. Technology has progressed and as a result we all spend more time on our computers tablets and smart-phones. Basic reading lenses no longer provide the best solution for the demands of 21st century life. Smart-Reader lenses have been developed for single vision wearers. The reading prescription is slightly reduced at the top of the lens making tablet and smart-phone use more comfortable. When using a PC, Smart-Reader lenses, provide a smooth transition from document to screen. Just because a lens is digitally surfaced does not mean it offers the improved vision of a freeform lens design. Conventional lens designs can be manufactured using digital freeform equipment but if the design is not freeform then it will not have the improved optics of a high-definition lens. Whatever vehicle you drive expect; exceptional panoramic distance vision, a crisper, sharper, more definitive view and an ample reading area. Advances in Computer Aided Design and free-form manufacture has resulted in the creation of the must have outdoor lens for 2014. Enhancing your driving experience, reducing fatigue and improving safety are all prerequisites for any driving lens. Traditional varifocal lenses tend to induce increased head movement to focus on satellite navigation devises, radio and dashboard. 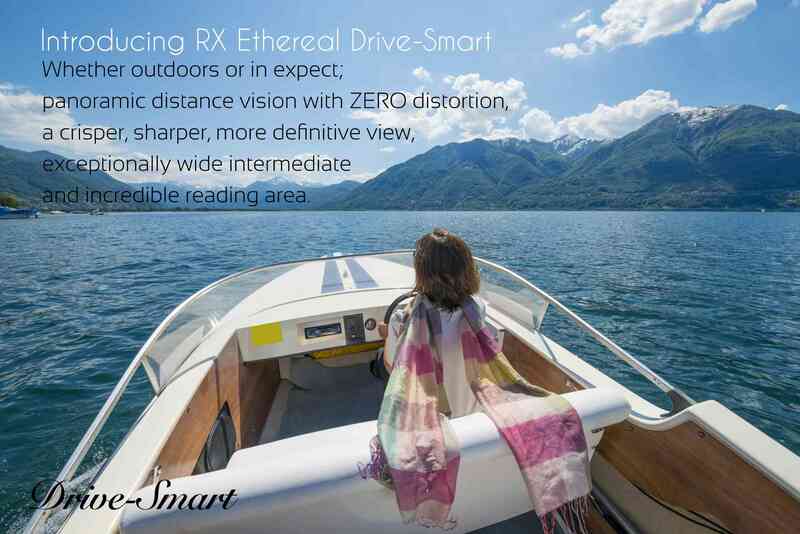 RX Ethereal Drive-Smart reduces peripheral aberration in far and intermediate zones to such a level that a single vision feel is produced. Freeform technology uses digital-point technology, which means each and every point on a lens can be unique. Simply put freeform technology is like having a tailor for your eyes, just like you can have a suit customized to fit your specific measurements, you can now have lenses made customized for your specific eye movement, prescription and frames.